Stuffed Chocolate Cookie Bars are Next Level!! Line a 9-x-13-inch baking pan with parchment paper and spray with nonstick spray. Preheat oven to 350 degrees F.
2. With the mixer running on low speed, add baking soda, salt, and cocoa powder. Then add flour and continue mixing until smooth. Finally add oatmeal to the bowl and mix until just combined. 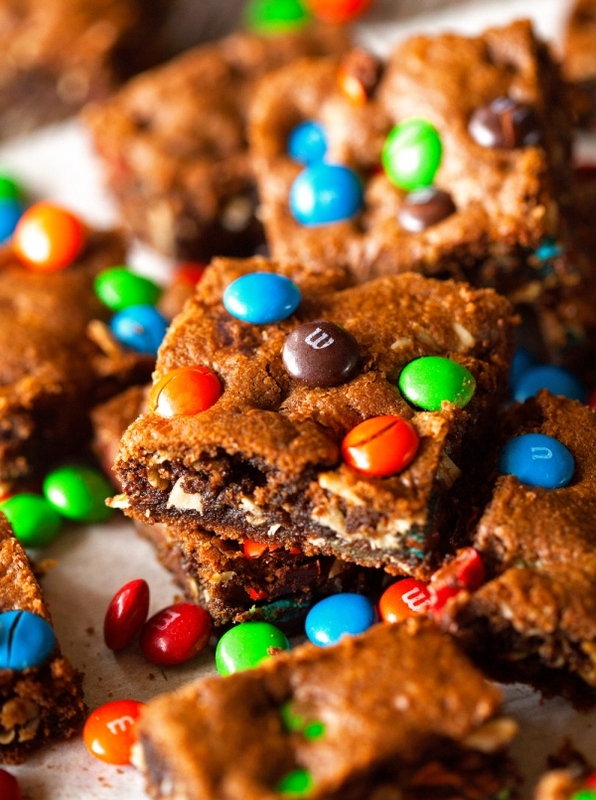 Remove bowl from mixer and using a rubber spatula, incorporate chocolate chips and m&m’s. 3. Press dough into prepared baking pan. Place in the oven and bake for 25-30 minutes or until a toothpick inserted in the middle comes out clean. Remove from the oven and let cool for 10 minutes. Remove bars from pan (using the edges of the parchment paper) and transfer to a wire rack to cool completely.